The University of California San Diego will recognize World AIDS Day on Friday, Dec. 1 to draw attention to the impact of HIV/AIDS on the San Diego community, the nation and the globe. In honor of the international event, which was established in 1988, the campus will sponsor a number of free activities open to the public including a display of three sections of the AIDS Memorial Quilt, the largest ongoing arts project in the world. The entire campus community is encouraged to wear red on Dec. 1 to honor World AIDS Day and remember those who have passed. At 1 p.m., a picture will be taken of faculty, staff and students wearing red in the formation of a living ribbon on the steps in front of the Triton Sculpture at the Price Center. Globally, there are an estimated 36.7 million people who have the virus. Despite HIV only being identified in 1984, more than 35 million people have died of complications related to the virus, making it one of the most destructive pandemics in history. A sampling of various activities, displays and other events on Dec. 1 are listed below. Click here to view the full calendar of events. 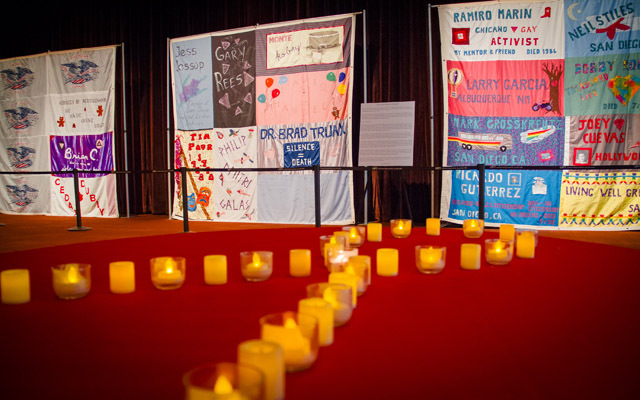 AIDS Memorial Quilt Display, 7 a.m. to 3 p.m., the Price Center East Ballroom: The AIDS Memorial Quilt, the largest ongoing arts project in the world, will be displayed along with live music. The sections on display are inspired by San Diego organizations and individuals as they have responded to the AIDS crisis, from the early years of the epidemic through the present day. Adjacent to the quilt display will be poster presentations from UC San Diego’s AIDS Research Institute undergraduate and graduate student researchers. “PrEP Talk” presentation, noon to 12:50 p.m., Cross Cultural Center: Ankita Kadakia, M.D., a physician from UC San Diego’s Owen Clinic, an HIV specialty care facility, will be talking about the once-a-day pill to help prevent HIV infections, Truvada or Pre-Exposure Prophylaxis (PrEP), which may be the most effective way for people who do not have HIV to prevent HIV infection. HIV/AIDS information and resources, 11 a.m. to 3 p.m., Library Walk: Along Library Walk there will be interactive displays and activities—provided by UC San Diego’s Student Health Advocates—that explore the history, milestones, prevalence and misconceptions of HIV/AIDS. Additionally, faculty, staff and students can receive free, anonymous HIV and STD testing from the Family Health Centers of San Diego in UC San Diego’s Town Square, parallel to Library Walk. Photo booth in honor of World AIDS Day, 11 a.m. to 3 p.m., Library Walk: There will be a photo booth where students, staff, faculty and community members can take pictures with props in honor of World AIDS Day.